What are trihalomethanes and how are they formed? Trihalomethanes (THMs) are a group of halogenated chemicals that form as disinfection byproducts(DBPs) when chlorine is added to drinking water. There are four THMs that make up the Total Trihalomethane (TTHM) category: bromodichloromethane, bromoform, dibromochloromethane, and chloroform. THMs are an unintended consequence of water chlorination. They are created when chlorine–a common disinfectant used by most water utilities–reacts in your pipes with organic matter. The term "organic matter" generally refers to a wide group of carbon-based compounds (like vegetation) called humic substances (or humic acids). These humic substances generated by the decay of soil, leaves, and other microbiology–and frequently occur naturally in water supplies. They are also usually present by the time water enters your home’s pipes–albeit in low concentrations. When water system engineers add chlorine to your tap water at the water treatment plant, it eventually reacts with humic substances and THMs form. 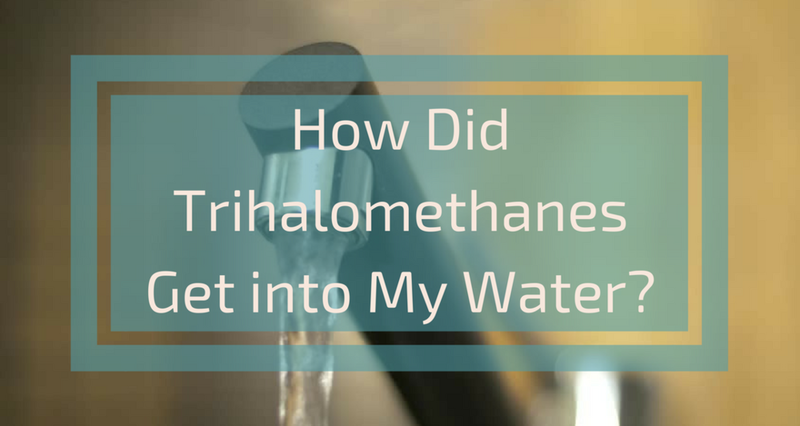 What dangers do trihalomethanes present in drinking water? What concentrations of THMs represent (1) significant health risks and (2) the maximum legal or recommended amounts in drinking water? Note: MCLGs are different from MCLs. An MCLG is the level of a contaminant in drinking water below which there is no known or expected health risk to humans. MCLGs are not enforced via health regulations and are more like health goals. For now though, it's best to assume that the lowest achievable value is safest. We, at SimpleWater, consider 0 parts per billion THMs as the “best” safe level. What type treatment methods are effective on the utility side? It is generally assumed that the risk from pathogens in your water is greater than the health risk from THMs. Therefore, water utilities continue to prioritize chlorine disinfection over THM elimination–almost everywhere. Because chlorine is a near-universal means of disinfection by U.S. public water systems, it is practically inevitable that some THMs will be in your drinking water supply. Other than minimizing and monitoring chlorine and humic acid concentrations, there is essentially no foreseeable way of removing THMs at the water treatment plant. Water system engineers want there to be a chlorine residual (often referred to as “the residual”) in your distribution pipes because this keeps your water safe from potentially harmful bacteria and viruses as it travels through the distribution system to your home. Unfortunately, it is this excess chlorine that reacts with organic matter present in your pipes to create THMs. Ultimately, this decision to chlorinate versus have no THMs is a tradeoff between safety from microbes and safety from THMs. How can consumers protect themselves from trihalomethanes? Purchase bottled water with lower published THM values. However, this isn't always easy to figure out, and bottled water has its own risks in addition to non-trivial environmental impacts. If you have a question about a particular treatment product, come to our website and ask us!